Deer often travel in herds. If one deer crosses the road, it is highly likely that a second or third may be nearby. Slow down when you see a deer near the roadside. Deer tent to bolt or change direction at the last minute. Use extreme caution when driving at dawn and dusk. This is when driver visibility is poor. Deer are most active between 6pm and 9pm. Do not swerve to avoid hitting a deer. Keep your car headed straight even if it means hitting the deer. 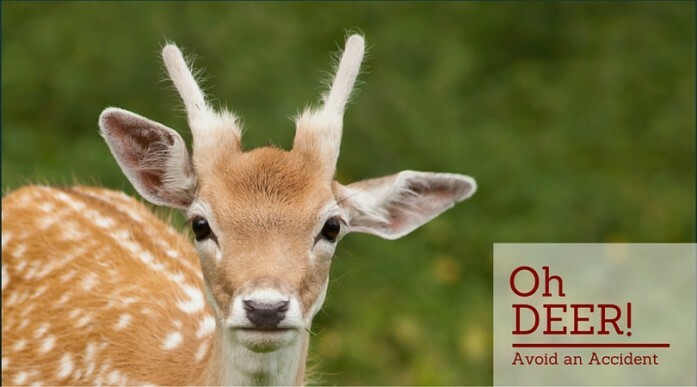 Many severe accidents are not due to colliding with deer but are the result of driving into another vehicle or tree while trying to avoid the animal. Use flashers or headlight signals to warn other drivers when deer are spotted on or near the road. Do not count on deer whistles or fences to deter deer from crossing the roads in front of you. Use high beam lights where possible to illuminate areas deer could enter roadways. Stay alert & Keep it slow! Drive safely this deer season!